Miss America 2019, Nia Franklin Will Walk Alongside Life-Sized Robots at NYFW Benefiting the Cristian Rivera Foundation. 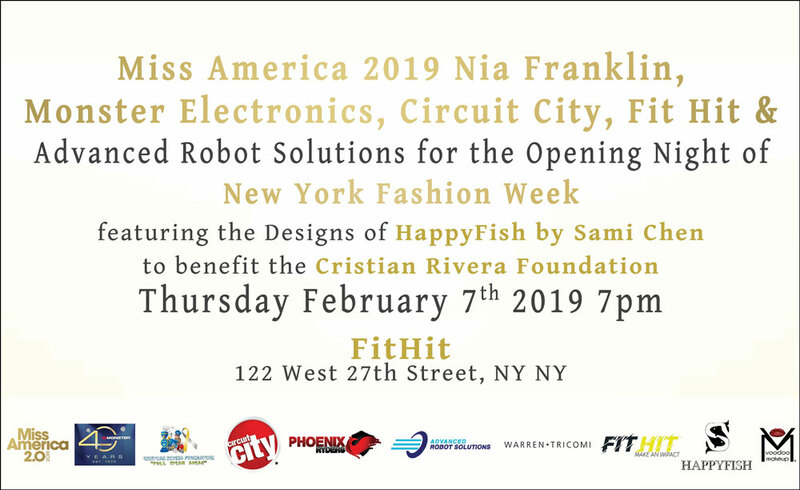 History will be made this fashion week in NY when 2019 Miss America Nia Franklin https://missamerica.org/titleholders/2019 -new-york/ will walk the runway alongside life size robots from Advanced Robot Solutions https://getrobotsolutions.com showcasing the 5th Season of Monster’s “Sound of Fashion along with Circuit City https://circuitcity.com/shop to benefit the Cristian Rivera Foundation http://cristianriverafoundation.org. This year Monster https://www.monsterstore.com in celebrating its 40th Anniversary, will feature the designs of Taiwanese designer Sami Chen of HappyFish Fashion showing for her 4th time at NYFW. Monster Products: For the past 40 years, Monster® has been a catalyst for innovation and big ideas. Discovering that cables in hi-fi systems influenced the sound, Head Monster Noel Lee developed Monster Cable – an immediate hit. Monster® engineered the sound of Beats® headphones, and has since become a leading manufacturer of high-performance headphones, all featuring Pure Monster Sound™ technology. Today, the company offers advanced connectivity solutions for professional musicians, home entertainment and consumers alike and sponsors the Sound of Fashion each season at New York Fashion Week to bring together music and fashion like never before. Circuit City comes with a long history of tech innovation, dating back to the late 1940’s, and intertwine s this deep rooted knowledge and know-how into the modern shopping experience. We believe in making the first move, encouraging gusto, and disrupting t he way that technology and commerce connect. Their personalized shopping platform is designed to give you the one -on-one customized experience you would get as if you had a personal shopping assistant by your side. Circuit City is extremely proud to have such a reputable brand name to work under and we don’t take this responsibility lightly. And while they are outrageously loyal to the prestige of this strong brand name, they also acknowledge that fun and exploration are essentially to maintaining any long-lasting, modern, and forward-thinking brand identity. Advanced Robot Solutions is the official master distributor for Future Robot, a South Korean service robotics company. The FURo-D model is currently the most popular robot on the market, with robots located in airports, hospitals, doctor’s offices worldwide. Cristian Rivera Foundation: Cristian Rivera’s journey and determination inspired his father, John “Gungie” Rivera, to start the Cristian Rivera Foundation, a New York City -based 501(c)(3) not-for-profit organization, that is committed to finding a cure for Diffuse Intrinsic Pontine Glioma (DIPG) (a form of pediatric brain cancer) through education, program funding and family support. The foundation strives to increase public awareness and understanding of Pontine Glioma, as well as raise funds that will support medical facilities and scientific trials whose primary focus is to find a cure for the disease. Miss America 2019 Nia Franklin: Nia was crowned Miss Five Boroughs at the age of 23, and then went on to win Miss New York 2018. And was awarded the job of Miss America 2019 on September 9, 2018. Nia has been a teacher and music mentor, and has written over 100 songs, including one she began performing at age five. For the Miss America 2019 competition, Franklin sang “ Quando m’en Vo’” from Puccini’s La Boheme and wowed audiences and judges alike. Nia is a native New Yorker and this will be her first time walking at NYFW. HAPPYFISH FASHION by Sami Chen will show in her 4th season at New York Fashion Week, following her successful two season premiere with Rolls Royce and Monster. Sami’s gowns and dresses have wowed audiences to live music and even dressed two celebrity show dogs and one talented rabbit on a sk ateboard who made their way down the runway. The dresses drew the full attention of the audience as the press could not get enough of her creations staying after the show to catch more. The show came from the creative inspiration of lead designer Sami Chen. Sami who learned her trade at Shih Chien School of Fashion in Taiwan and has been designing womenswear since childhood. In addition to being an internationally recogniz ed fashion designer, Sami is also an accomplished concert pianist and has won many competitions since the age of 5. “Happy Fish by Sami” was inspired by and symbolizes the joy and freedom associated with her designs along with her state of mind. As a bright star of the ne w fashion world, Sami’s smile and uplifting demeanor is not only evident in her creations, but also her personality. See www.HappyFishSami.com.